We love these two shops on Sudder Street – Sunshine and Gomukh – because that’s where we get our super colourful and flowy bottoms, dresses and skirts, and all things funky from (and it’s so pocket-friendly)! And you can also pick up super gifts for everyone – for your mum, your friend or bae, you will find something for everyone here. At Sunshine, you must pick up the Tibetan bags (INR 1,000) which will add just the right amount of bling to your wardrobe. We also love the stoles here – starting from INR 300 these would be perfect gifts for your mother. 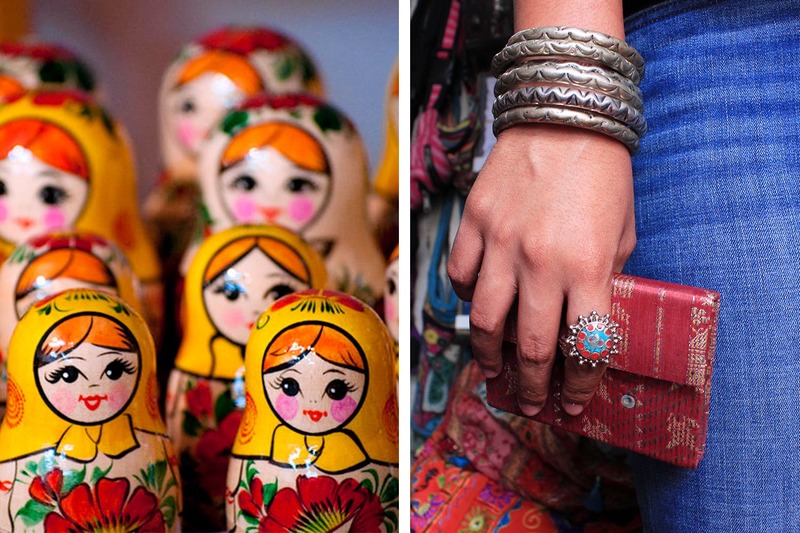 Add a touch of quirk to your room with Russian dolls (INR 280), or those trusted prayer flags (INR 60) and singing bowls (INR 250). If none of these caught your attention, they have prayer wheels, Buddhist symbol lockets, incense holders, wooden boxes for storage, tea packed in cute papier-mache boxes, the list is endless. Love to travel? Or want to gift something special to a fellow traveller? What is better than a compass? It starts at INR 150. Gomukh gives us major Goa feels with a collection of long, flared skirts, dhoti pants, boho maxi dresses and tops. You can style an entire outfit for under INR 800. Their skirts start from INR 300, dresses are for INR 250 and more and tops will cost you INR 200 and more. Sunshine has a huge collection of silver and non-silver jewellery. Rings with different coloured stones, earrings you won’t be able to look away from and statement necklaces that will add the oomph to your outfit. Silver jewellery starts from INR 500 (depending on the weight), non-silver earrings will cost you INR 200, necklaces will come for INR 300 and more. Gomukh also stocks funky jewellery which you can pair with your outfit. Rings start from INR 50 and the bohemian necklaces in different colours will cost INR 200. From camel leather diaries to handprinted ones to diaries with mythological motifs, Sunshine has a huge range. They all come in different sizes as well. Diaries start from INR 80 and go up to INR 600. Right next to these shops is Raj’s Spanish Cafe, try their juices to get your quick summer fix. Both these shops are hidden gems inside a slightly dilapidated property. Enter the lane right opposite the fire brigade and ask anyone where Sunshine or Gomukh is, they are right next to each other. Make sure you take a keen look, because certain things may not be on display.